I popped round to my friend Dina’s at the weekend (Dina happens to be a top makeup artist as well as my friend!) – and she had just been to Superdrug on a massive nail polish mission. While she was making me a cup of peppermint tea, I rather cheekily nicked the Rimmel Lycra Pro and gave my nails two quick coats of polish! The brushes in the Rimmel Pro polishes are so wide that they cover your whole fingernail in one go – application is almost foolproof, which is the only reason I managed to do two coats in the time that it took Dina to put a teabag in a mug and pour some hot water over it! 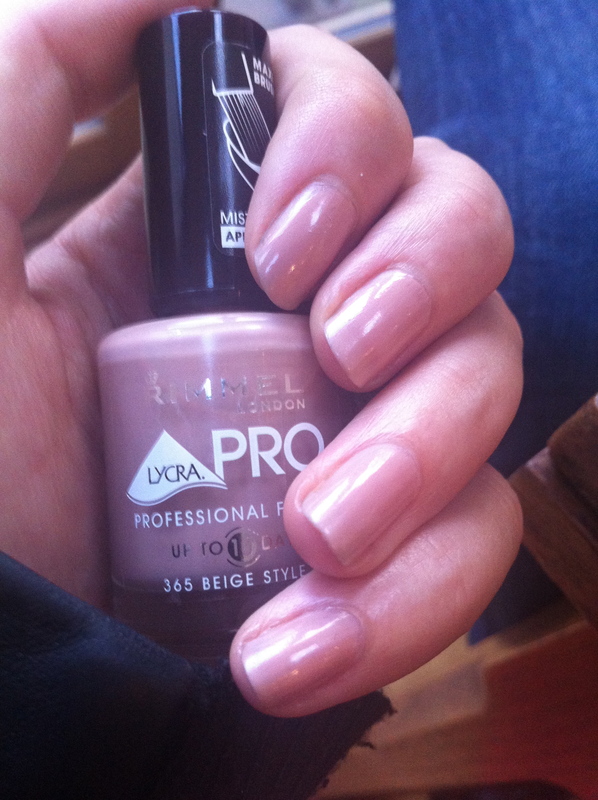 I love this shade, too – it’s almost identical to my skin colour and makes my nails look very polished and neat. I’m 100% going to buy this nail varnish for myself – it’s only about £4.50 and the finish is, as it claims, ‘Pro’. Hardwearing, very opaque and dries quickly. The brush design is very, very clever and I’d like to see it adopted by more nail varnish manufacturers, please!